With hand outstretched and palm facing skwards, thousands of Greeks direct the "montza", a gesture of deepest loathing and disrespect in the direction of the nation's parliament, the most visible outward sign of the anger and sense of betrayal many people feel towards the ruling PASOK party and the current political system in general. They call themslves ,"The indignant" and for twelve days crowds have gathered in the centre of cities and towns across Greece to show their dissatisfaction with the current economic crisis caused by the imposition of austerity measures designed to rein in Athens massive public spending deficit. The package designed by the IMF, European Commission and the European Central Bank was intended to put the country's financial house in order and allow it to repay the massive debt load acquired over decades of unchecked public spending. However, the economic recipe of wage reductions, public spending cuts and privatisations has seen a sudden leap in unemployment, business closures on an unprecedented scale and consumer spending drop precipiticiously. Despite lowering pay and pensions Greek prime minister, Giorgos Papandreou has been unable to stop the Greek eonomy from going into free fall and is now faced with the unenviable task of persuading his own party, parliamentary opposition and the population in general that even more drastic measures need to be taken if the country is not to default on its obligations to creditors. 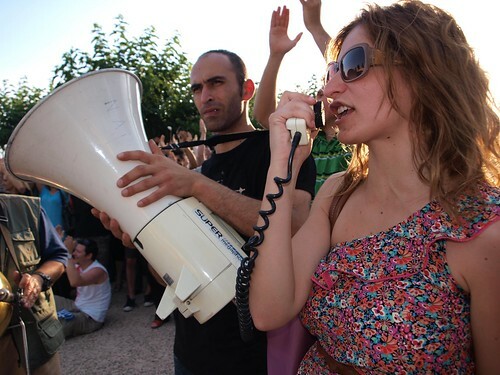 Most unsettling for the administration is the spontaneous appearance of a natiowide protest movement modelled on previous demonstrations in the Arab world and Spain. Using Facebook and other social media sites the "Aganaktismeni"or Indignant have repeatedly been able to use the internet to muster crowds of hundreds of thousands in Athens, Thessaloniki and other Greek cities, However, in contrast to previous mass demonstrations the peaceful nature of the rallies has flummoxed the authorities more used to using riot police and tear gas to deal with popular dissent. 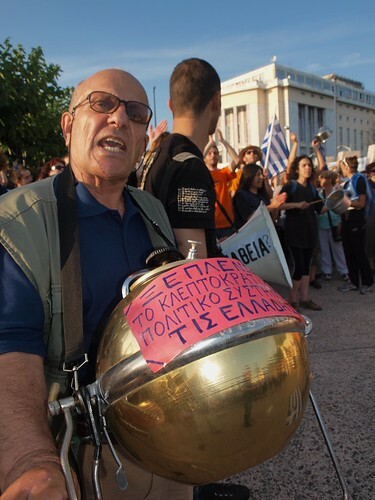 With protests growing in size day the options available for Giorgos Papandeou seem to shrinking day by day. For more pictures check out the Demotix article.